Over the course of the past decade or so, phone calls have died off as our primary form of communication with most people, with text messages being the replacement. And if you’re going to use texting as much as you do, you might as well be using the best apps to do it. 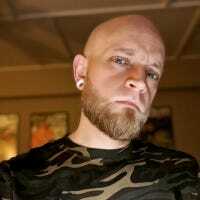 Let’s talk about ’em. 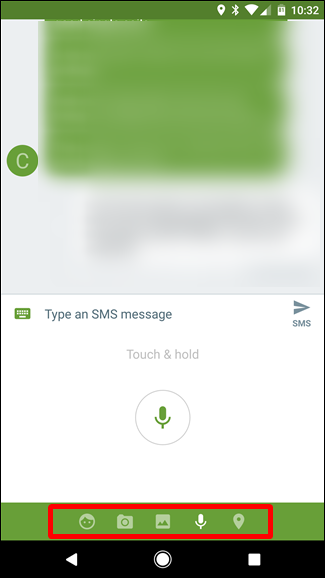 Android Messages is Google’s vision for SMS apps on Android, and the stock option on Nexus and Pixel devices. The good news is that it’s available in the Play Store, so it works on any phone, and it’s completely free. What makes this app such a good choice is its clean, minimal interface— it just works really well. It isn’t filled to the brim with superfluous features, it just does what it does. Really, this is what most of us have come to expect from Google’s apps. 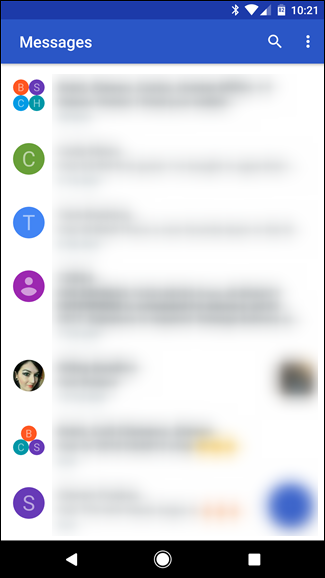 You can also customize conversations by assigning specific colors to contacts, but it will also do this for you automatically if you don’t want to be bothered with setting up each contact. 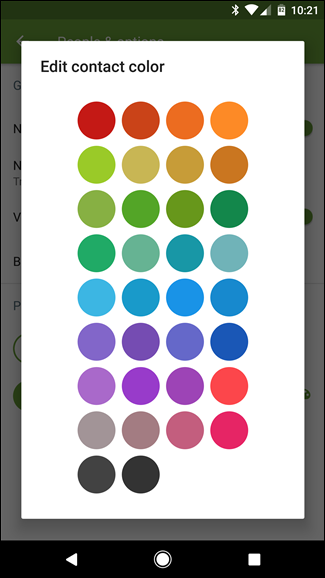 After a while, you start to associate each contact with their color, so you can glance at your phone and know who exactly the text is from just by color. It’s a simple feature that just makes sense. In short, if you’re looking for a simple text messaging apps that just works, this is the one for you. Nearly all of us are on Facebook, and if you’re anything like me, you use Facebook Messenger almost as much as SMS for talking to friends and family. But here’s the thing: you can actually do both things directly from the same interface, since Facebok Messenger supports SMS. It even has what I feel is the best feature of the app: Chat Heads for your text messages. So you can unify all of your messages in this one place. I dig it. 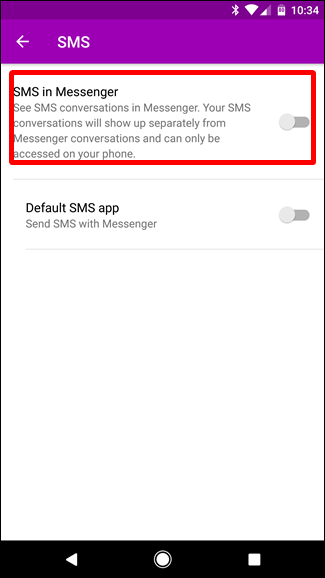 If you’re already Facebook Messenger user, you can easily enable SMS in the app to give it a try. First, open the app and tap on your profile picture in the upper-right corner. In this menu, scroll down and find “SMS.” Tap on that, then hit the “SMS in Messenger” slider. 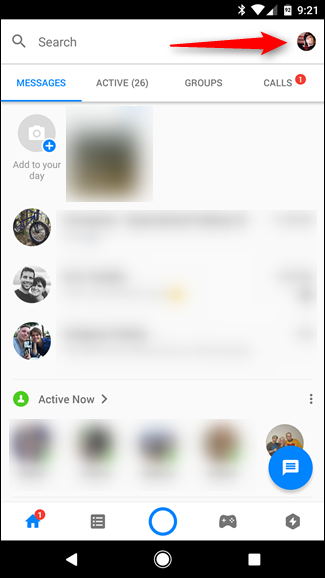 A popup may ask if you’d like to use Messenger as your default client—just tap “Yes.” All sorts of new options will be available after that, so feel free to customize it to your liking. 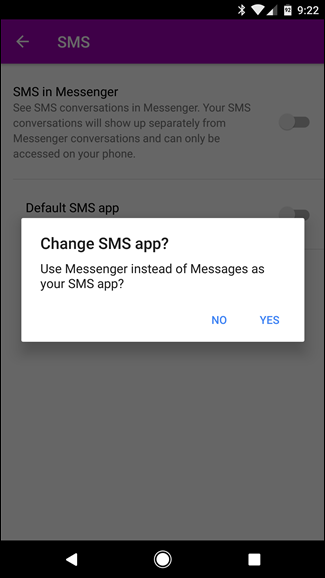 Otherwise, you’re ready to start using SMS in Messenger. 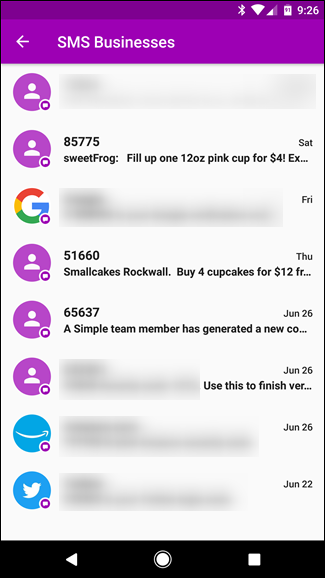 It’s also worth mentioning that aside from the normal Messenger features (like Chat Heads), Messenger also does this cool thing where it groups together “business” SMS—any sort of texts you get from businesses with promotions, etc. This is pretty sweet because it keeps your feed cleaner. I think that’s pretty cool. Also, if you just want to see SMS and keep your Facebook Messages out of your feed, just tap the “SMS” button in the top beside your profile image. Bam. Oh, and it’s free. It’s hard to beat that price. 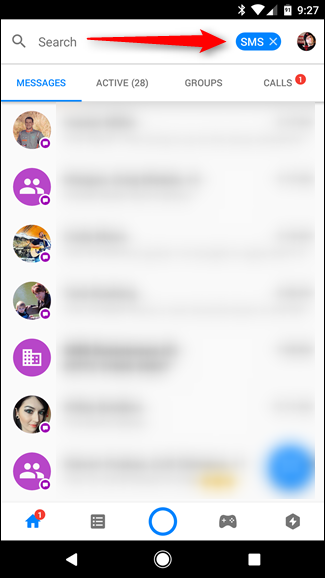 If you’re looking for all the bells and whistles from you SMS client, then look no further than Textra. This thing is chock-full with killer features, but it still somehow manages to not feel bloated. But really, I think that’s what makes Textra so great: on the surface, it can be as simple as you want it to be, but if you feel like digging in, you can really customize it to do so much more. Out of the box, it features a clean, dark interface. 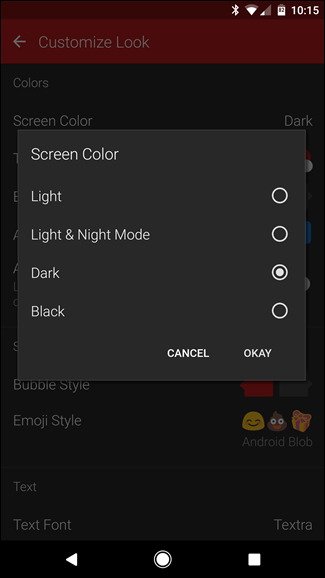 But if you’re not into that, it has theme support—like, dark, black, and even a smart mode that will be light during the day and switch to night mode at a specific time. 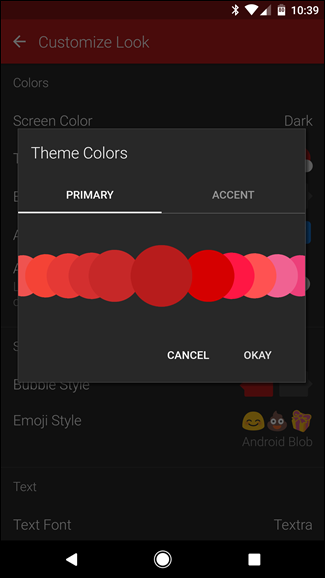 You can also completely customize the color palette used, as well as the chat bubble and icon color. So, if you’re into aesthetics, you can pretty much get Textra to look however you want. 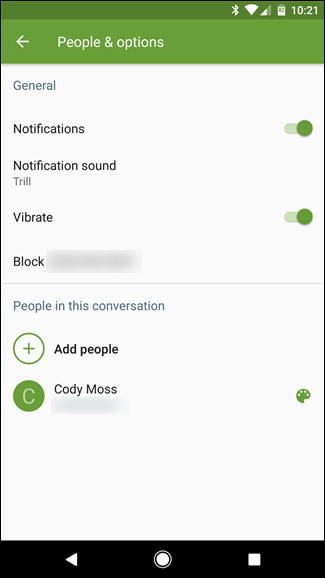 You can rename group texts. 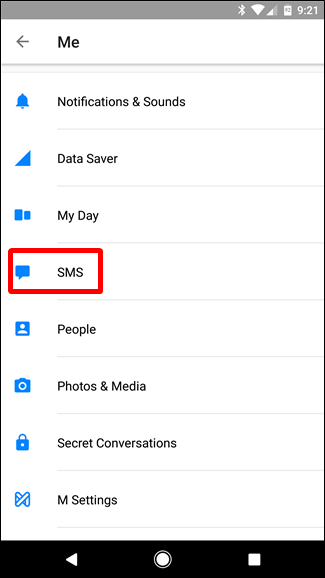 You can specify a sending limit for MMS messages, and Textra will compress accordingly. 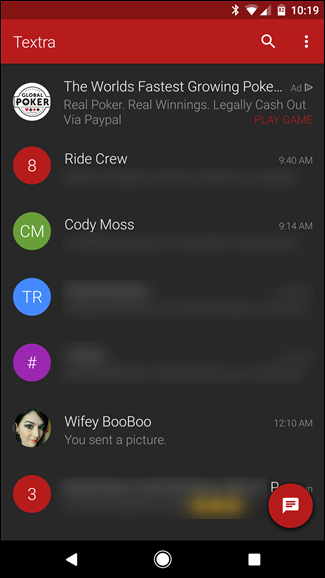 Quick replies, heads up notifications, and everything else related to notifications are customizable. …and really, that’s just the start. Like I said, if you’re a power user, this is the app you want. There’s only one downside: the free version has ads, which are displayed inline as the first entry in your SMS list. It’s really annoying. But there’s a $2.99 in-app purchase that removes ads, which is easily worth the price if you find that you dig this app like I dig this app. Now, armed with this new knowledge, go forth and text.